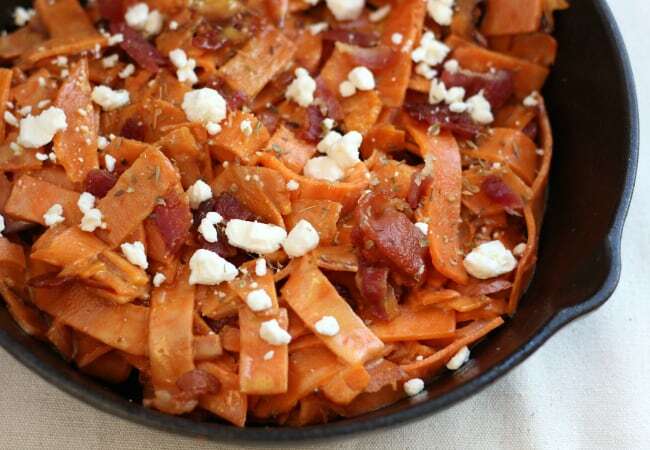 Bacon Feta Sweet Potato Ribbons recipe was brought to you in partnership with Mann's. All opinions are mine. I have a deep love for orange vegetables. Sweet potatoes are part of our diet year-round. 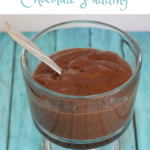 Sure, they may be known as a side dish topped with marshmallows at Thanksgiving and Christmas, but if that is the only time you are eating them, you are missing out! 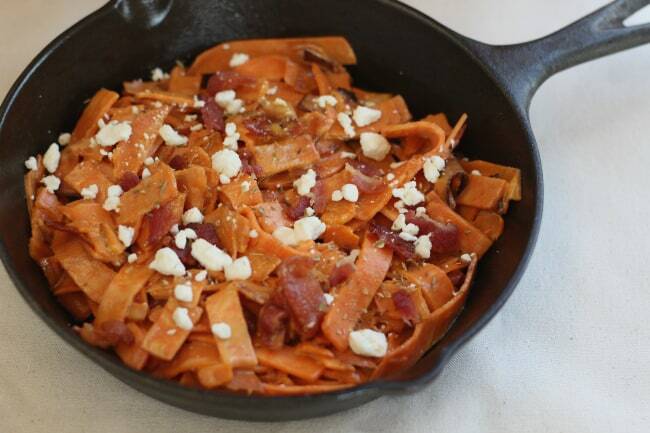 Sweet potato fries, sweet potato noodles, sweet potato toast…the list just goes on and on. 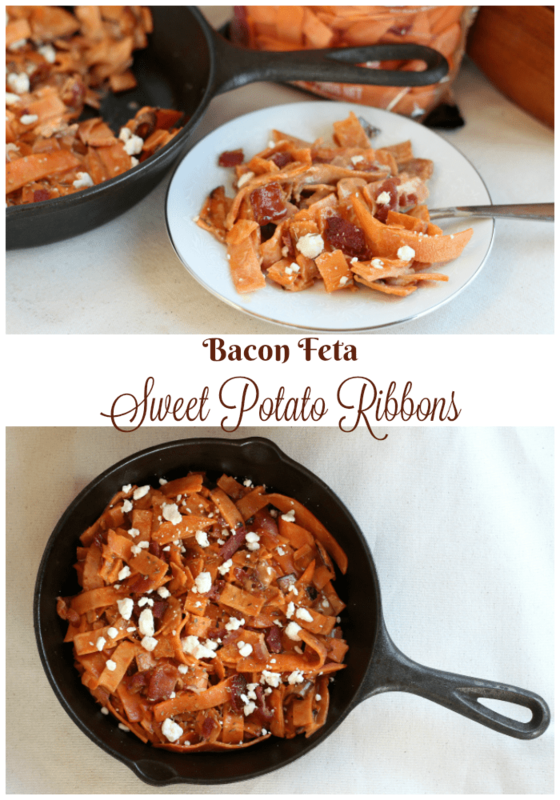 I created this delicious Bacon Feta Sweet Potato Ribbons recipe and it is perfect as a side OR by itself. While I have fond memories of eating sweet potatoes, I also have not so fond memories of cutting them. One holiday, I even sliced my thumb trying to cut a raw sweet potato into chunks. 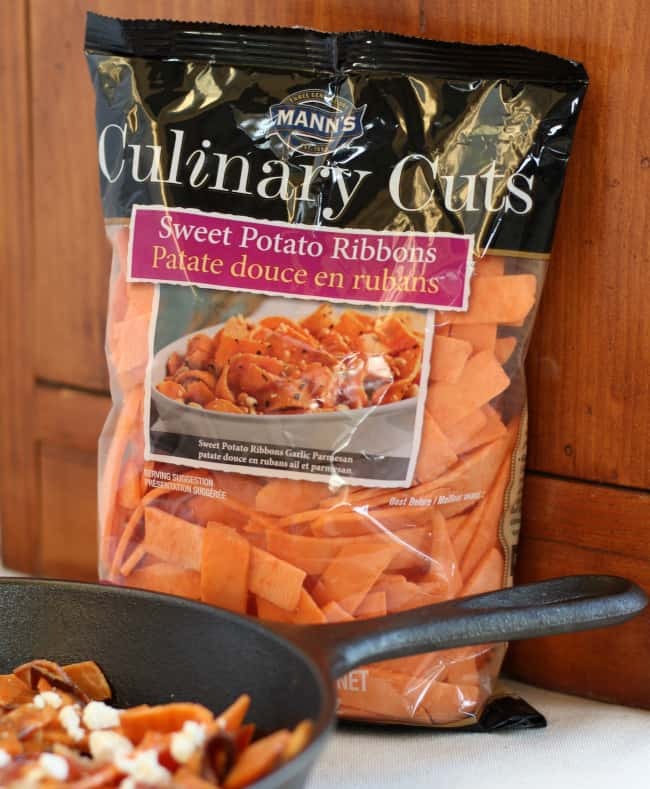 Sparing you the gory details, let's just say that I am SO thankful for Mann's, who do all the work for us with their Culinary Cuts Sweet Potato Ribbons, which are the main ingredient in this recipe! 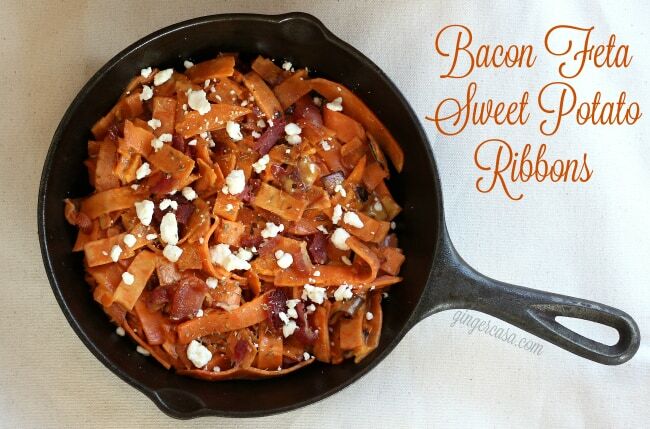 Cut or slice bacon into small pieces and cook thoroughly in a cast iron pan over medium heat. Take bacon pieces out and place on a paper towel to drain. 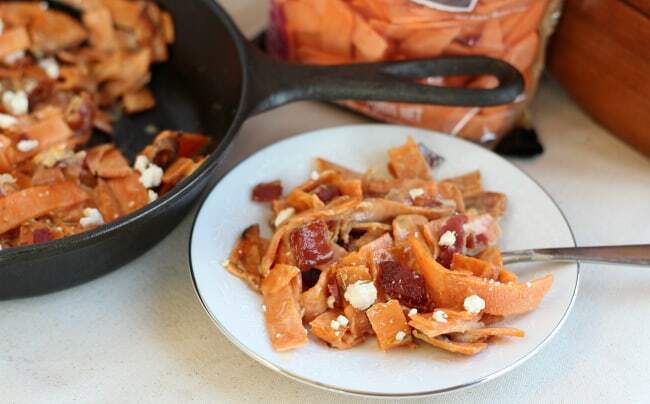 Keep bacon grease in the pan and pour entire bag of Sweet Potato Ribbons into hot pan. Saute sweet potato ribbons in bacon grease for about 8 minutes over medium-high heat, stirring often to make sure they do not burn. Add in heavy whipping cream and broth and cook for about 3-4 minutes more. 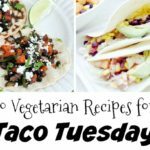 Top with feta cheese crumbles and oregano and serve! 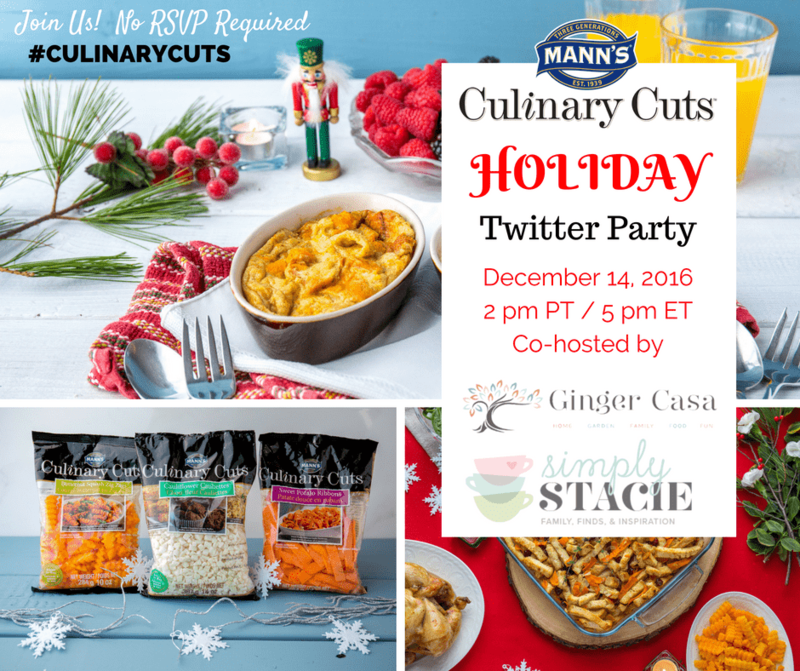 Get more great tips and recipes at the #CulinaryCuts Twitter party on Wednesday!